The Great Depression started in 1929 and lasted until 1939, ending only with the boost provided by a war economy. Unemployment during the Great Depression climbed to double-digit levels and remained that way for close to ten years. The Great Depression started in the United States when the stock market crashed on October 29, 1929. This day became known as 'Black Tuesday.' Until then, American consumers were increasingly borrowing (and repaying) money, there was rampant speculation on the stock market, and stock prices were often inflated. Stock prices began to slide in the summer of 1929, and the selling reached a panic level by October. The market's all-time low occurred in July of 1932 and 1933 was considered to be the height of the Great Depression. By that time, almost 50 percent of U.S. banks had closed or were near failure. The total number of banks dropped by about 30 percent between 1929 and 1934, with an average rate of 600 banks failing per year between 1921 and 1929. As a result, trade levels (exports of goods), jobs, and personal income plummeted throughout America, causing revenue from taxes collected by the government to fall dramatically. Construction came to a virtual standstill in some regions. Farmers had a difficult time as commodity prices bottomed out. Some agricultural products were down by as much as 60 percent. The gross domestic product (GDP) was reduced by nearly one-half, falling from $104 billion in 1929 to $56 billion in 1933. This financial crisis led to a significant (and negative) impact on employment, both in the U.S. and abroad. Unemployment rose significantly in cities, especially those where many workers were employed in a single industry. Record Unemployment in the U.S. 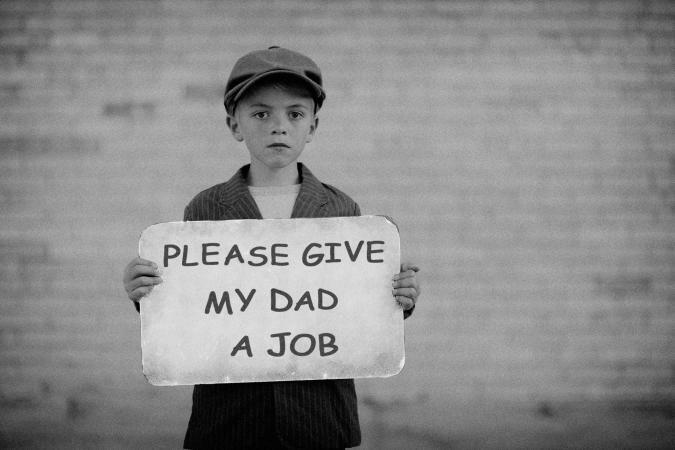 In the United States, unemployment rose to 25 percent at its highest level during the Great Depression. Literally, a quarter of the country's workforce was out of work. This number translated to 15 million unemployed Americans. The unemployment rate didn't drop below ten percent until after the country entered World War II in December of 1941. Widespread unemployment during these years has a significant impact on the U.S. population. Social assistance programs that exist today to help people through tough times were not available then. There was no unemployment insurance to provide benefits to people who were without work. People who were lucky enough to be employed were afraid of losing their jobs and ending up like the many displaced workers who 'rode the rails' looking for employment. The Great Depression's impact on employment extended well beyond the United States. Canadian unemployment rates were even higher than in the United States, with 30 percent of Canada's labor force out of work. In Glasgow, unemployment rose to 30 percent overall. In areas like Newcastle, where the main industry was shipbuilding, the situation was much worse. The shipbuilding industry experienced a particularly deep slump, sending the unemployment rate there to a whopping 70 percent. More than 200 workers from Jarrow, in the northeast part of England, marched to London in October of 1936 to deliver a petition signed by more than 12,000 people asking the government to take action, since the region was suffering extreme poverty. The Prime Minister, Stanley Baldwin, refused to meet with them, but they were successful in delivering the petition to Parliament. One of the first actions taken by Franklin Roosevelt when he became President of the United States in 1933 was to declare a bank holiday that lasted from March 6-13, 1933. His administration was also responsible for introducing legislation to insure banks. Additionally, Roosevelt's government was responsible for passing laws to give mortgage relief to farmers and people who owned homes. As a result, government loan guarantees became available to new homeowners and more than 20 million people were given government assistance. The arrival of the World War II in 1939 created jobs for unemployed workers, both within and outside of the armed forces, finally helping to end the Great Depression. Factories started making weapons, equipment, and other items for the military to use. Women entered the workforce in droves, doing jobs that had been previously held by men, starting a trend that would continue throughout the war effort.